A graph shows the stark rise in anti-Semitic attacks in the U.K. The number of anti-Semitic hate incidents recorded in the U.K. rose by 16 percent in 2018, making 2018 the third year in a row to see a record total of anti-Semitic incidents, according to figures released this week by the Community Security Trust (CST). CST recorded 1,652 anti-Semitic incidents nationwide in 2018, the highest annual total they have ever recorded. The figures for 2017 and 2016 were 1,420 and 1,375 respectively, both of which were record annual totals. CST has recorded anti-Semitic incidents since 1984. CST recorded over 100 anti-Semitic incidents in every month of 2018, the first time this has ever happened in a single calendar year. Looking over a longer period, CST has now recorded over 100 anti-Semitic incidents in all but five months since January 2016; this only occurred on six occasions in the decade prior to 2016. This pattern of consistently high incident totals suggests an enduring situation in which people with anti-Semitic attitudes appear to be more confident to express their views, while incident victims and reporters may be more motivated to report the anti-Semitism they experience or encounter. The highest monthly totals in 2018 came in May, with 182 incidents; April, with 151 incidents; August, with 150 incidents; and September, with 148 incidents. It is likely that these higher monthly totals were partly caused by reactions to political events in the U.K. and overseas, involving the Labour Party and violence on the border of Israel and Gaza, during those months. CST recorded 148 anti-Semitic incidents in 2018 that were examples of, or took place in the immediate context of, arguments over alleged anti-Semitism in the Labour Party. Of these 148 incidents, 49 occurred in August, 16 in September and 15 in April. These were all months in which allegations of anti-Semitism in the Labour Party attracted significant media and political attention. Also in April and May, several Palestinians were killed and many injured in violence connected to protests at the border between Israel and Gaza. CST recorded 173 anti-Semitic incidents in 2018 that showed anti-Israel motivation alongside anti-Semitism, of which 47 incidents occurred in April and May. In 2018 as a whole, CST recorded 84 anti-Semitic incidents that showed far-right motivation, and 13 that showed Islamist motivation. 2018 saw an increase in the number and proportion of anti-Semitic incidents that used political or extremist language and imagery. 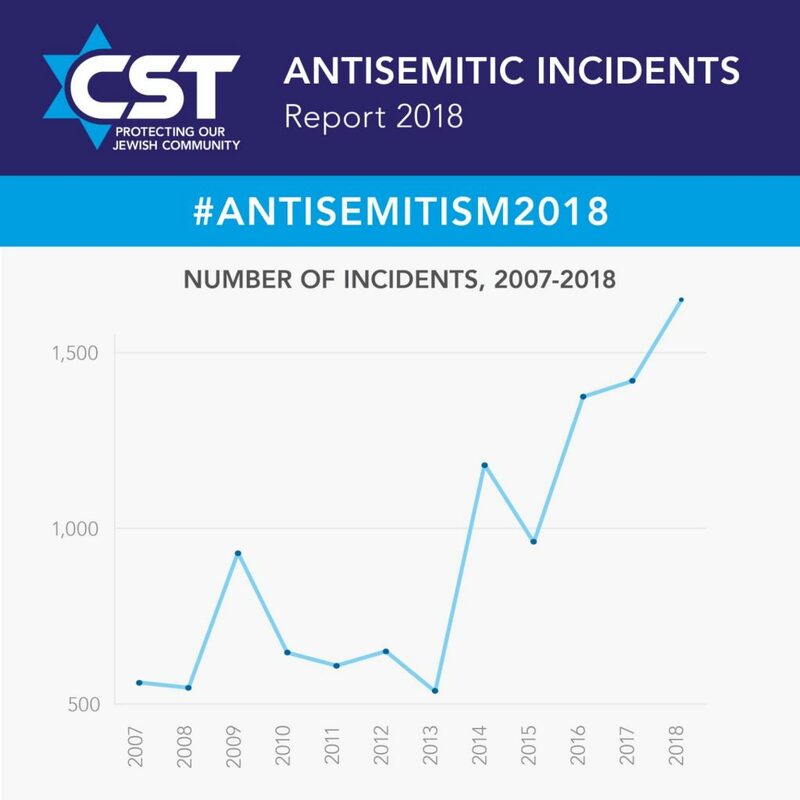 Forty-five percent of the incidents recorded by CST in 2018 involved the use of extremist language or imagery alongside anti-Semitism, compared to 30 percent of incidents recorded in 2017. The most common single type of incident recorded by CST in 2018 involved verbal abuse randomly directed at visibly Jewish people in public. In 483 incidents, the victims were Jewish people, male or female, attacked or abused while going about their daily business in public places. In at least 224 incidents, the victims were visibly Jewish, usually due to their religious or traditional clothing, school uniform or jewelry bearing Jewish symbols. A total of 724 incidents involved verbal anti-Semitic abuse. CST recorded a 17 percent decrease in the number of violent anti-Semitic assaults, from 149 in 2017 to 123 in 2018. There were 78 incidents of damage and desecration of Jewish property in 2018; 1,300 incidents of abusive behavior; 109 direct anti-Semitic threats; and 42 cases of mass-mailed anti-Semitic leaflets or emails. Almost three-quarters of the incidents were recorded in Greater London and Greater Manchester. CST recorded 950 anti-Semitic incidents in Greater London in 2018, a rise of 21 percent from 2017. In Greater Manchester, CST recorded 250 anti-Semitic incidents, a fall of 5 percent from 2017. Beyond these two centers, CST recorded 452 anti-Semitic incidents across the United Kingdom in 2018, compared to 386 incidents in 2017. This included 55 in Hertfordshire, 34 in Gateshead, 23 in Leeds, 19 in Liverpool, 16 in Sheffield, 12 in Glasgow and 11 in Birmingham. Anti-Semitic Hate Incidents Remain High in 2018 in U.K.